BLOODSTOCK festival is excited to announce another batch of bands for August’s event at Catton Park! Regrouped Brit industrio-metallers, KILL II THIS join the main stage for a Saturday slot. 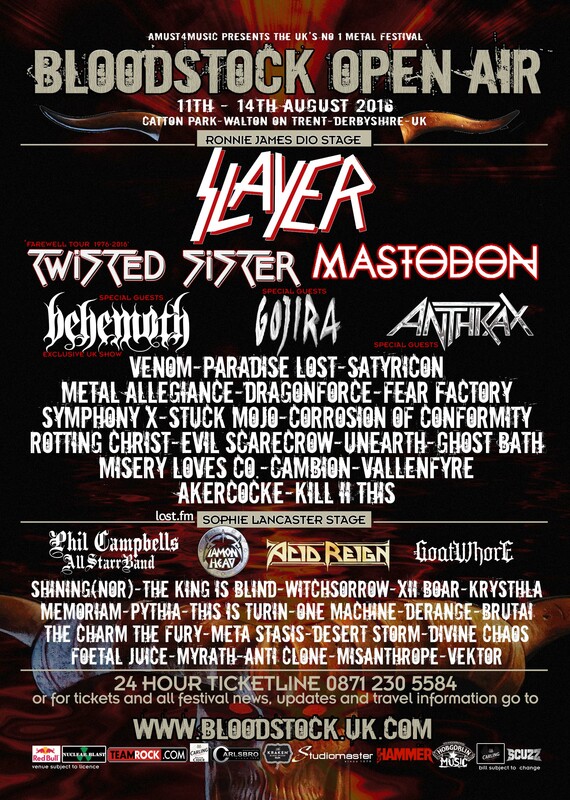 Frontman, Mark Mynett says “BLOODSTOCK is one of the finest metal festivals there is; this year’s stunning line up says it all! So we are both delighted and honoured to be playing the Ronnie James Dio stage.” Check out their video for ‘The Universe In A Nutshell’ here; https://www.youtube.com/watch?v=myNgEf8I7jU. Also landing Friday slots on the Sophie stage are Brit crust/grindcore monsters, FOETAL JUICE and British apocalyptic metal crew, ANTI CLONE. Tunisian symphonic prog metallers, MYRATH play the Sophie stage on Saturday, as do French avant-garde extremists, MISANTHROPE. Lastly, stepping into a Sunday Sophie slot are US progressive thrash beasts, VEKTOR. Already announced for 2016 are the three headliners, TWISTED SISTER (in their last ever UK show), MASTODON and SLAYER, plus special guests BEHEMOTH, GOJIRA and ANTHRAX. Also on the bill are FEAR FACTORY, CORROSION OF CONFORMITY, SYMPHONY X, SATYRICON, PARADISE LOST, DRAGONFORCE, METAL ALLEGIANCE, STUCK MOJO, ROTTING CHRIST, MISERY LOVES CO, GHOST BATH, VENOM, UNEARTH, DIAMOND HEAD, GOATWHORE, ACID REIGN and many more. Additional bands are still to be announced.